There must be something in those carrots, because it usually takes a bit to raise two teenagers from their beds on a Sunday morning! 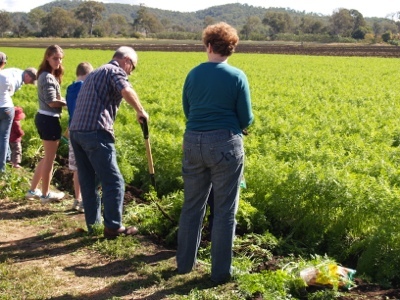 Kalfresh was begun by Robert Hinrichsen nearly twenty years ago as an attempt to combine similar vegetable farmers in the Fassifern Valley to increase their impact in growing, selling and marketing under one brand. Their large packing, processing and distribution facility is a testament to their innovating thinking. It houses a very impressive cleaning and cooling system for carrots that turns out the product to an accredited standard suitable for export and the domestic market. 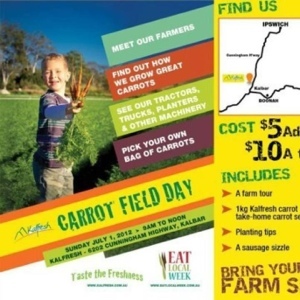 The mind behind the Carrot Field Day was Alice Gorman, an award winning journalist who writes for many publications and most recently produced a series called ‘Ask A Farmer’ featured in the LIFE section of the Courier mail. She is one of the biggest supporters of Australian farming I know; a former city girl with incredible wit. 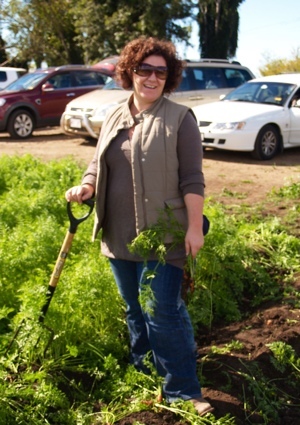 I love her take on becoming part of a farming community after marrying Richard , the Managing Director and part owner of Kalfresh, also affectionately known as ‘Mr Bean’. Mr Bean took on his role as tour guide with the same ease I would imagine he takes on at a board meeting or a John Deere at carrot harvest. Turns out he is a bit of a pied piper with kids, as he was followed by a steady swathe of them as we toured around the premises. He explained how all of the carrots are used, and certainly nothing goes to waste. 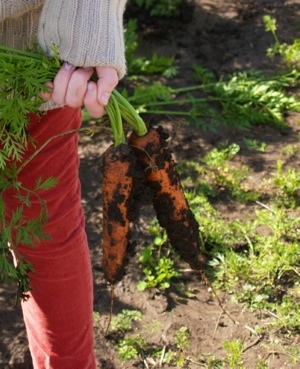 Carrots not suitable as 'A Grade' all end up being used in a variety of ways, including juicing, in ready-made products such as 'Kantong', and pet food and as feed for cattle. The tops get churned back into the soil. Next came the moment my girls were looking forward to. 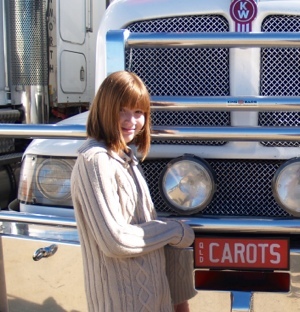 We formed a cavalcade of vehicles, led by the balloon decorated pilot vehicle, ferried along the Cunningham Highway to a glorious field of carrots. Armed with bags, we were let loose to dig out a bag of carrots to take home. 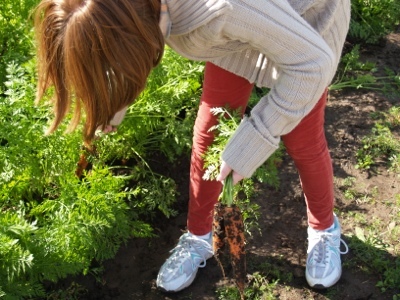 There was particular excitement amongst the kids, including mine, at the simple act of getting dirty and pulling carrots! It’s kind of sad to think how much we are withdrawn from such simple and beautiful things. The farmers seemed chuffed by the questions and genuine interest in what they do. We came home to Esk armed with beautiful carrots, seeds and a great respect for the people that produce this beautiful product. 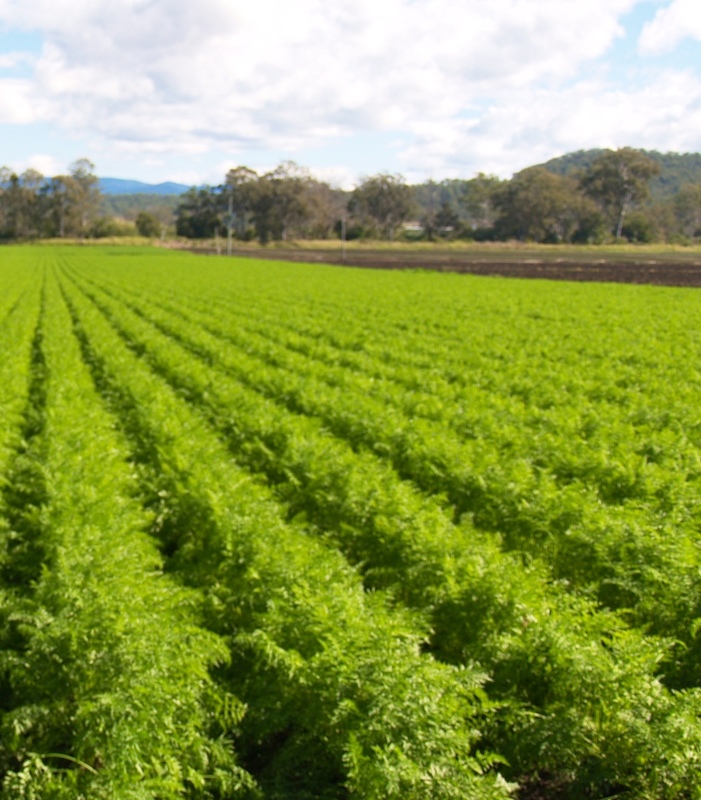 It takes a lot of work and innovation to produce a carrot that is so sweet and crunchy, and it’s another example of our farmers leading the way with a consistent, high quality product. 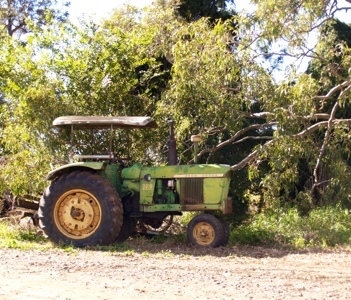 Whilst at the farm picking carrots, I just had to take a photo of this old tractor, to remind us how it used to be done. 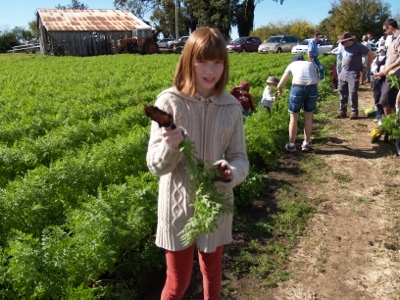 You see my partner’s father spent quite a few years of his early married life growing carrots around Glen Innes, where the soil would freeze in the winter, the tractor was a Farmall similar to this and the carrots were hand washed, graded and hand sewn into hessian bags for delivery to the Brisbane Markets. It kind of put him off the idea of growing them as as a lifelong career! I hope there is another Carrot Day next year. 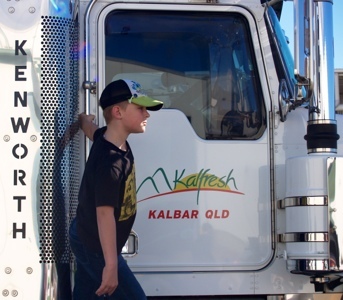 I get the impression that even the Kalfresh guys were a little surprised at the positive outcome, and it shows that there are many people out there that are interested in what our farmers do. Sometimes when you are ‘inside’ a situation, you don’t always see what the outsider is appreciating. Thanks to Richard, Robert and all the staff at Kalfresh for putting on a great morning. The teenagers voted with an ‘amazing’ as their extensive synopsis of the event; I believe that’s a most positive recommendation…. In teenage terms. Alice has a very great blog of her own, which can be found at http://www.alicegorman.com.au. It’s ‘real’ and it’s good value. You can also follow her on Twitter at – @farmerhasawife. I have had the pleasure of working with Patti Pocock since I started at Faith last year, and she and I have shared many conversations on farming in Australia. Patti’s father was one of the first pioneers of the cotton industry in Australia and chairman of the Qld Cotton Marketing Board, now Cotton Australia. She spent a considerable amount of 2011, after recovering from the floods, in looking at different possibilities, after the closure of the Golden Circle Cannery closure at Norgate saw the collapse of the beetroot growing industry in QLD. I asked Patti to talk about her experiences of life in a farming family. I have always lived in the country – apart from 6 years when I moved to the city for work in my early 20s. Even then I remember thinking on my way back to the city after a weekend at home, that I would have to marry a farmer so I could enjoy this peaceful area forever. I met Tim some time later and we married part way through his nursing training. He too had grown up in the country – Boonah. His family had been dairy farmers in the past, mainly producing cream. They later concentrated on beef cattle. I loved visiting there with Tim, helping with mustering and branding and it became a dream that we would move there and take this up as a living. His parents were not encouraging at all and tried their hardest to put us off. In the meantime, my father had decided to make his crop farm more viable by expanding into another crop – beetroot, which had been growing locally for many years. He had the opportunity to purchase a contract with Golden Circle, so we were asked to join in this venture. My childhood on a farm was pretty cruisy. It revolved around playing in the cotton after it was harvested. Of course, we were helping dad ‘tramp’ it. We had lots of room to ride our bikes, have friends over, help mum bake, play cricket or softball. We participated in the local Scouts (for my brothers) and Guides for us girls, so there were weekend camping trips interspered at times. My weekend job was to mow on the ride on mower. Dad employed a worker on the farm, and with 2 sons, the girls didn’t help out on the farm apart from our ‘tramping’. We would chip in the holidays to earn pocket money so that we could go on holiday trips. Returning to the valley with a young almost 2 year old, and 2 months off having our second child, was quite daunting. I had carved a life of my own away from home and now I was returning and living across the road from my parents again. My children loved it and I realized that for them to grow up in the country was the best I could give them. I never really became a part of the farm though; mum still did the office work and Tim eventually took this over and enjoyed the financial side of the business. I found I could work from home as a private piano teacher and this suited our lifestyle and bringing up a family. My role has been one of support to a farming husband, as well as a business partner. We split from the family farm 6 Years ago and I had just started working full time away from home. Last year was one of the most challenging times we have had in our farming history. After 20 years of drought, we were hit by the worst flood in known history. Less than 6 months later, we were told our beetroot contract would be terminated at the end of the year, with no warning. We had meetings with the Minister of Agriculture and had support from other MPs and officials. We put money together to have a feasability study done to see if there was a viable future for beetroot. We tried many avenues, but to this end it seems we had been beaten, beaten by a system. Importing from overseas turned out to be cheaper than what we in Australia can produce, and it is more important to save money where we can (according to our supermarkets) and so they tell the consumer, but at what cost! Of course some countries can produce at a much cheaper price than we can. Their costs are lower (we have stringent standards with very high safety requirements), their costs for hiring are lower and their interest rates are considerably lower. How can we compete? But why should we have to? We should not be importing what we can produce here. Our produce is far superior with less concern to our health due to the high standards put on to us by our government. Our children, who have by now finished their studies at University, have in the past stated they would consider farming in the future. We encouraged them to finish their studies then consider when they would take up this opportunity. They also enjoy living in the country and the peacefulness that this gives. We have felt that the farming lifestyle is a good one and would hope that they could be successful in this role. We are now rethinking this. What opportunities are there for our youth on the land now? Simplot, the Australian vegetable processors have today told us that it is too costly to transport produce from Qld to them (New South Wales) for canning. With rising costs across all avenues, there doesn’t seem to be a positive outlook for farming in the future. How will we continue to feed our country? Import from overseas? This seems to be what our government will do. They (our government), are earning more from selling off our land to other countries – so that they can continue to feed their own people – than in providing for our own. Or sell our resources off to other countries thereby ruining our farming land so that it is no longer able to be farmed. Tim and I have done a lot of overseas travel in the past couple of years and believe that we do indeed live in the lucky country, however, we also see these other countries caring a lot more for their own people and environment than Australia does. I believe we are heading backwards in this regard at a huge cost to our own people. I’ll the first person to tell you I was not born into a farming family and I have no long term experience in one particular aspect of agriculture; What I do know is that I have had a lifelong passion for it and along the way it has kindly adopted me. As an ‘outsider’ looking at the bigger picture, I have to say I am truly amazed by what I see. The more people I encounter and the more I discover about Australian agriculture, the prouder I become. 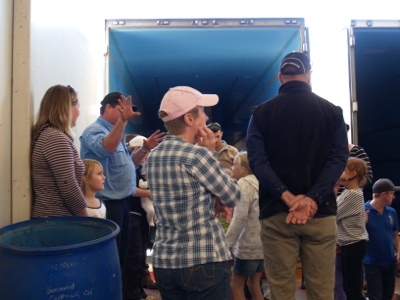 Recent events, such as the Royal Easter show in Sydney, showcased some of the best the industry has to offer, whether it be the livestock, the produce and the incredible ‘Food Farm’ where people could actively explore the origins of their food and fibre. Art4Agriculture’s (www.art4agriculture.com.au) painted cows graced the entrance, as testament to the incredible work begun by Lynne Strong, collaborating with schools to create an awareness of farming’s contribution to our everyday lives. From observation, the site has already begun to make its mark, and people have been asking, and getting answers to their concerns as consumers. It is to be hoped that it truly makes its mark as a reflection of all the positive things that DO occur in agriculture. There are so many good things occuring in agriculture, and so many of our farmers have illustrated their committment towards producing high quality sustainable produce in the fields of food, feed and fibre. Using Social Media such as Facebook, Twitter, Pinterest and the various blogging platforms such as WordPress and Blogger, connections can be made readily, often between people who would have never come across each other before. There is a geographical divide between where a lot of our food and fibre is produced. Consumers are not always aware of the origins of some of the most basic of their food items and many have never thought purposefully about the chain of events that occur between say a beast in the field and its arrival in the store in portions. As a teacher, dealing with food and fibre, I am often suprised by the naivety of students in regards to the origins of their food. I don’t necessarily think it is out of a lack of concern; rather a lack of it at a conscious level in their everyday lives. My concern lies in the promotion of agriculture. There are some absolutely terrific efforts being made by many in the industry to ‘sell’ the importance of farming to the consumer. However, if you want consumers to take note, it is important to spend the time and develop relationships with the people whom you feel need to understand your position. It is human nature to tend to want to spend time with people of similar interests, lifestyle and values as yourself, but it is more of a challenge to seek out someone different, and to actively listen to their concerns. Some of the best promoters I’ve seen are those that interract with the non farming public; people who get to directly promote their product to the customer. It is in their best interest to promote the virtues of their goods and listen intently to the customer and their needs. Commodities that may go through several steps along the value chain may be more of a challenge because the product may not resemble the original source eg. wheat that ultimately ends up in other products. There is a lot of talk about the importance of farming to us all and the need for people to understand where their food comes from, but there is a need to create relationships that enhance the understanding. If people stand back and wait for the relationship to develop and the ‘divide’ to close then there will be a lot of waiting going on. Finding ways to meaningfully connect is the challenge. With further understanding of the importance of agriculture by consumers, so does the possibility of further questioning of how well the job is being done. The ‘social licence to farm’ takes on a greater relevance as people pay greater concerns to the manner in which food is produced. Strategies that help put the farming’s best foot forward are more timely than ever, and the challenge now is to march forward as a united front. We have a house full of noise and fun at the moment. Imagine the scene of three noisy teenage girls and one ten year old doing her best to tag along and you’ve just about got it. The school I teach at runs an exchange program with students from Korea. We have the pleasure of two of the girls staying with us for three weeks. During the day, they attend our school and are “buddied” with students who accompany them throughout the day. On the weekend, we can take our girls out on trips and spend the rest of the time relaxing and learning about them. Collectively, we have just enough English and Korean language skills to get by, but there have been some funny moments. We discovered early that Korean students wear slippers to school. I thought Ann and Katelyn had just forgotten to put their shoes on in the hall, because in Korea, one does not wear shoes inside. Both girls proceeded to wade through the sodden ground outside to the car before I realised and quickly explained they would definitely need them. Everything here is “big” they tell me. Our dogs are big, and despite their sookiness, caused some concern. It wasn’t long before Ann was practising her English skills on Rolly the cattle dog and Charlie the cat – “Sit Charlie, sit”! Our insects and frogs are scary too, and too “big”! I have to agree sometimes. I brought in a dead, 10cm rhinoceros beetle to show the girls, and I had a hard time even convincing my kids it wasn’t going to take off and hiss at them. Of course there are so many universals. Some of their classes are apparently as noisy as ours (I was suprised), nasty teachers – uh oh, naughty boys in class, eating lollies, talking on the phone to friends and pop music. My daughters already love “K-Pop” or Korean pop music, and this impressed our Korean guests. My rendition of some of the songs I know brought more general amusement than serious appreciation of my prowess as a singer! I leave you with 2 videos today. The first, by a Canadian teacher, living in Korea, shows that school does have its craziness, wherever you go. The other is a popular K- Pop song “Okay Go”, by B1A4, which I defy you not to keep liking. It has a tune that tends to stay in your head all day. Next post will be a Korean cooking special. Considering Korea is our 3rd biggest export market for beef, I will take you through the making of bulgogi, which is like a Korean bbq. My daily travel takes me between two valleys, the Locker to the Brisbane. Forget the grind of car piled upon car, and the stop and go of traffic lights; this is a visual treat! The soil is alluvial, rich and chocolately. It sustains an incredible array of farming, particularly horticulture. The floods of a year ago have gone, and the landscape is recovering, reflective of its generally forgiving nature. Travelling along you will see an array of crops, dependent upon the season. Right now it is time for corn,onions, sorghum, and lucerne. The last of the beautiful mangoes will come onto the market soon, not as rosy as their northern cousins, but full of beautiful flavour. Most of the cattle you see now are raised for beef. Years ago, these areas were spotted with flourishing dairy farms. The familiar black and white of the holstein and the brown eyed jersey were replaced by the santa gertrudis, brahman and charolais, and every beef crossbreed imaginable. I am never dulled into complacency by the world outside my car window. It simply reminds me of the dynamic nature of farming and the generosity of the soil. Fostering the farmers of the future. 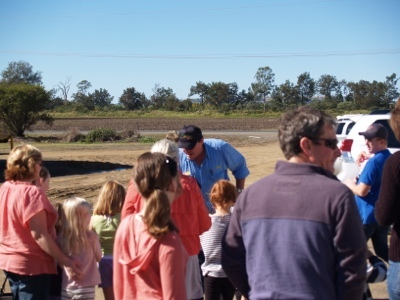 Ever thought about mentoring our young in schools on your wealth of knowledge as a farmer? Whilst the Year of The Farmer is about honoring the work of our hardworking men and women in Agriculture, there is so much experience and knowledge at hand to invest into future generations. I love to bring mentors into our class. It is a mutually beneficial thing for that person and the young people they get to interract with. When I take on a new class of Ag students, I am always interested to find out who may have a farming background, and if we can weave that into the program for the semester. Last year we were lucky enough to have a dairy farmer and a couple of vegetable growers who become involved from time to time in our classes. The experience was valuable to us all and the students were so genuinely appreciative of the time these folk spent with us, talking about their experiences, providing advice and practical experience. There are several formalised mentoring programs about for farmers considering offering their time and experience to mentor young students. 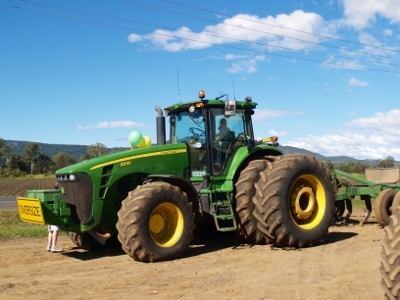 Agforce Queensland have a unique program called the Rural Champions Program. 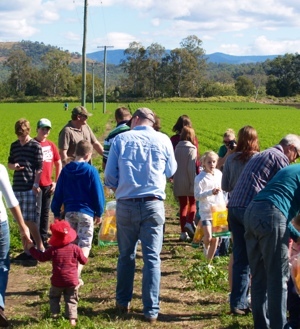 It aims to promote the importance of Agriculture to Primary and Secondary students via volunteers, at promotional events and school to farm visits, or longer term mentoring in a particular school. The Young Farming Champions Program , organised through Art4Agriculture, is a special initiative that trains young farmers from different disciplines to engage with students in local schools and promote the Art4Agriculture school program. It also allows them to directly market their particular industry to a captive school audience and its diverse career pathways.